I rediscover these steps every time I deploy a new real or virtual machine for BOINC - need to write these down once and for all. Currently participating in SETI@HOME for over 15 years and a few Large Hedron Collider (LHC) projects from the inception of LHC@HOME; here are my BOINC Stats. I have no headless BOINCTasks PC; all computers run their own BOINC servers and command clients all on localhost. If your firewall is configured to allow all traffiic on localhost 127.0.0.1 this is not required. Check the status - switch to boinc account. team_name: The Knights Who Say Ni! description: View information about your team: The Knights Who Say Ni! Ever since I started maintaining a free public IP address blocklist listing sources of brute-force attacks I am seeing and putting the list up on the lighttpd web-server for anyone to use, there has been a remarkable growth of traffic that lighttpd is being asked to service. This blocklist is based on the jail contents of fail2ban, generated hourly from fail2ban jails using a cron job, that I describe here. My fail2ban setup including automated reporting to blocklist.de over email is documented here. Though lighttpd is not overwhelmed yet, I decided to take some load off it and put a varnish server-side cache before it, working purely off an in-memory cache since all the web-server does is provide a static page and a hourly-updated bloc-klist. With Varnish cache delivering web pages from memory, a load test via loader.io shows 57 milliseconds average response time with 0.0 % error rate for 100 to 250 clients over 1 minute. The varnishtop screenshot at the top was taken during this test. It took some effort to configure varnish http cache to get it to work. Here are the configuration files for varnish reverse cache and lighttpd that I am using. My lighttpd configuration gets lighttpd to bind to and listen on the localhost (127.0.0.1) IP address on port 65481. Varnishd uses this local lighttpd server and port as the backend and serves HTTP requests from external clients on the usual port 80 on the internet-facing interfaces. The varnish configuration below is generic, i.e. it has no dependency on lighttpd - any httpd will work as the backend of Varnish as long as Varnish knows what IP and Port Number to use as the backend. I am using varnish version 4.0.3 and lighttpd version 1.4.41. Got Fail2Ban working? Have a Web Server running? Post a public blocklist for others to use! So I have fail2ban working, reporting happily to blocklist.de, as documented in this post. I also happen to have lighthttpd web server running on the server. The fail2ban-client tool that is included with fail2ban can list out all the IP addresses in a jail. So I wrote a simple script to dump the banned IPs in the fail2ban jail into a file in a location under the web server's root. Then, adding it to cron, I have a free brute force attack source public IP address blocklist based on real brute-force attacks on my server. Others can use this list as one of the sources of bad IP addresses to block on their own server. This is a quick recap of how I set up fail2ban with real-time reporting to blocklist.de from my public internet-facing Virtual Private Server (sanyalnet-cloud-vps.freeddns.org) running CentOS 7. Fail2ban continues to provide a robust first line of defense against the numerous dictionary and ddos or brute force attacks faced by any internet-facing cloud server. blocklist.de has been providing a very valuable blacklist for a long time for free, and I wanted to take this opportunity to contribute back to blocklist.de as well. Right after installing an operating system and bringing it up, any new cloud server open to the internet should be hardened first. For my CentOS 7 installation, I found and followed a great set of basic hardening instructions at the highon.coffee blog and also made more tweaks that I documented here. Then set up your internet email service. I installed and configured my email service to use postfix for SMTP and dovecot for POP and IMAP. I used the awesome instructions here to do so. Fail2ban defaults to sending emails from the address of "fail2ban@<hostname>" and there is no need to change this behavior. A quick way to validate your email MTA is to install the mailx utility and confirm that outgoing emails are being sent successfully - you can send a email from the server to your gmail account, for example. I then registered an account at blocklist.de and added my server. While adding the server, provide your current IP (dynamic IPs are okay as blocklist provides a separate email address for reporting intrusions on a server with dynamic IP). Also leave the API Key field empty - it will be filled in for you later. I configured fail2ban to use ipset (instead of, and better than, iptables) to keep track of addresses to block. Check if you have ipset installed, and if not, install the ipset packages using yum install ipset. You should have the packages similar to the following installed to proceed. As the attackers started coming in fast and furious, fail2ban was the logical next step. Installing fail2ban is a breeze, thanks to its easy availability from the epel repository. The three steps below are all that are needed to install and bring up the initial configuration of fail2ban and get it ready for modifications needed to use ipset and send intrusion activity reports to blocklist.de. Once the default fail2ban configuration is up and running with ipset, I created a /etc/fail2ban/jail.local file that overrides a few configuration items with what I need. Since I use the free and very nice Uptime Robot service to monitor my servers, I whitelisted the Uptime Robot IPs that reach out to my server often enough to be flagged as intrusions with failed logon attempts by fail2ban. The list of IP addresses that Uptime Robot's robots use are conveniently listed on the Locations and IPs page on Uptime Robot web-site. Tweaked findtime, bantime and maxretry a bit. I use a ban time of 48 hours only because blocklist.de automatically un-bans IP addresses 48 hours after adding them to their banned IP block list. Enabled the fail2ban intrusion reporting filters corresponding to the services provided by my server - ssh, postfix, sendmail and dovecot. The results can be seen readily if the server name is googled. Also look at your /var/log/maillog and /var/log/fail2ban.log to verify everything is working as expected. You can download a complete tarball of my /etc/fail2ban directory including default and custom configuration files that report intrusions to blocklist.de from my google drive. Open a terminal or a command prompt, enter telnet sanyalnet-cloud-vps.freeddns.org and press Enter again quickly. A random fortune cookie message will be returned to you, formatted by cowsay. Do it again. A different random cowsay formatted fortune cookie will be presented to you. These are delivered by a little Linux server daemon "cowsayd" I wrote in C for really no good reason in the spirit of fortune and cowsay. Running on my CentOS 7 hobbyist VPS, the publicly accessible daemon serves cookies on the standard TELNET TCP port 23 from the Linux fortune database, which is based on Ken Arnold's BSD implementation. After a connection is received and accepted, I require some input from the client (just pressing the Enter key suffices) before sending back a cowsay formatted fortune cookie. This is an attempt at gracefully handling the continuous connections from automated bots which are probably looking for a "username:", "login:" or some such prompt and rarely send any inputs. So I hope mostly humans will read what is shown on the screen ("Enter anything to hear the cow speak.") and react correctly to receive a fortune-cowsay message for fun. This fortune/cowsay server does not need to listen to connections from more than one port, as it servers clients on just one port. Hence, the select() system call and associated family of macros are not needed by the fortune+cowsay server. The server works by invoking a shell command that in turn executes fortune and cowsay and returns the output back to the server, which passes it on to the client and closes the connection. The shell command is invoked using popen() which is thread-safe in Linux, and works well for getting a message from fortune/cowsay. The use of pthread_attr_setdetachstate with PTHREAD_CREATE_DETACHED is demonstrated. This server spawns a thread to service every connection and the spawned thread exits after servicing a connection. The main thread never waits to join the spawned threads. If we do not create detached threads for this scenario, memory usage will keep increasing every time a thread is spawned since the default attribute of PTHREAD_CREATE_JOINABLE will never release all service thread resources becuase it expecting the main thread to join and ask for the return value. Obtaining the client IP address is demonstrated using the inet_ntop() function. It logs into the same file as sshd (usually /var/log/secure) in a format designed for abusers to be picked up and banned by fail2ban if installed. fail2ban is configured on my server to also automatically email blocklist.de for more general dissemination of telnet spammers. I also maintain a blocklist file free for public use. To compile the cowsayd server, we need to include the -lpthread switch on the gcc command line, since it is a multi-threaded server. Once compiled, copy the binary to the directory /usr/local/bin. Here is the complete source code of cowsayd.c. The init script I use to start, restart or stop the cowsayd daemon follows. Copy this to /etc/init.d/ and make it executable using chmod +x /etc/init.d/cowsayd and then chkconfig --add cowsayd to add it to the chkconfig daemon management system. If correctly done, chkconfig --list will show the cowsayd daemon and the runlevels it is enabled for. chkconfig cowsayd on will enable starting up the daemon on reboot. All CentOS package installations are usually via the yum tool. Use yum install <rpm-filename> to install RPM packages. head over to http://dl.fedoraproject.org/pub/epel/7/x86_64/e and download the latest epel-release*.rpm (epel-release-7-8.noarch.rpm at the time of writing). Cowsay is implemented in perl, and is therefore a set of perl scripts with no dependency on architecture as long as there is a usable perl interpreter installed, which should be the case with most installations of CentOS. If perl is not available, install perl first using yum install perl. To install cowsay, you need cowsay-3.03-20.el7.noarch.rpm, and optionally cowsay-beefymiracle-1.0-6.fc24.noarch.rpm and cowsay-morecows-1.0-11.4.casjay.el7.x86_64.rpm. The latter two provide various additional cows and other assorted animal art. Then yum install the beefymiracle and morecows RPMs - if the links above do not work, use the download link to my google drive at the bottom of this post. .b .h .E` # J: 2` . JT7"' O. .J,; `` V"7N. 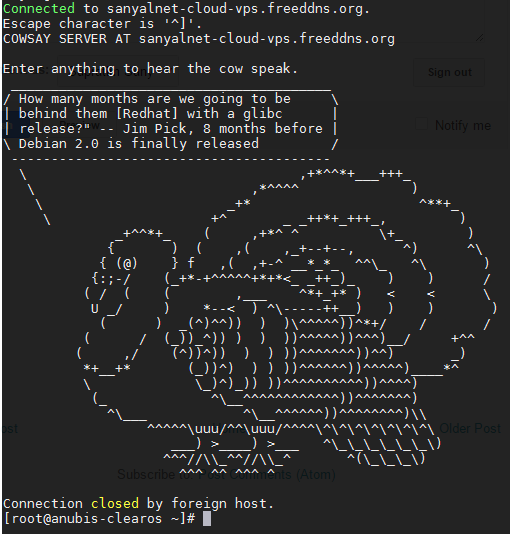 To get a mood-lifting fortune-cowsay message every time you log in, create a file /etc/profile.d/custom.sh with the following contents. You can download everything you need for free, including the cowsayd source, binary, init script, login script and Fortune and Cowsay RPMs for CentOS 7 from my google drive. Linux iptables, included in Centos 7 distribution, provides a mechanism to block basic network attacks. This is a guide to set up basic iptables firewall rules to protect your server from some of the most common and simplest network attacks. Also disable the Centos 7 firewalld daemon. It attempts to provide an interface to manipulating iptables which I do not want and do not use at all. The first step now is to examine your existing rules with line numbers. Otherwise, if some rules are defined, you will see them with line numbers, as in the following example of what I see. Note: I use fail2ban and custom blocklist scripts; the following example includes the resulting rules. In any case, we start by inserting a rule at the top of, i.e. line number 1, the ACCEPT list to drop fragmented packets. This blocks IP fragmentation exploits like IP fragment overlapped (teardrop), IP fragmentation buffer full, IP fragment overrun, IP fragment too many data-grams, IP fragment incomplete, IP Fragment Too Small and similar attacks. We use the -I switch with iptables to insert a rule at a position 1. Next, we stop Null Scans, which are basically a bunch of TCP packets with sequence number 0 and no flags set. Such packets are not used in proper network communications, and are used to find open ports or holes by hackers. The following command will insert the rule at the top of the ACCEPT table, pushing the existing rules down by one line. We next stop TCP "Christmas Tree" packets - unusual packets that have all flags set. These packets are used by hackers to explore the security and features of servers, and often provide clues to the underlying operating system because operating systems react differently to such packets. Again we insert this rule at the top (line number 1), pushing existing rules down. Finally we attempt to check TCP SYN Flood attacks by inserting a rule at the top. After executing these four commands, the first four rules in the ACCEPT change should show the resulting iptables firewall rules, followed by whatever other rules existed before. We need to make the changes permanent, i.e. persistent across system restarts and reboots. On my server, iptables starts up on reboot using the default rules file /etc/sysconfig/iptables and then eventually other applications add what they need later on (e.g. a script I run to block of malware / attack sources based on publicly available blocklists, fail2ban jails created by fail2ban, etc.). Finally, please make sure your /etc/sysctl.conf file has some server hardening parameters, including for securing your network. Here is mine. You can use the following iptables as the starting point. Simply copy and put it into /etc/sysconfig/iptables and then adjust the ports that it opens up for the services your server provides.